Aloe mitriformis derived it's name from the shape of it's rosette that resembles a mitre or a bishop's cap, especially so during times of drought. Distribution: Western Cape, Nieuwhoudtville to Genadendal. Found on granite outcrops, rocky ridges and lower slopes. Description: Plants (75 cm) sprawl along the ground with ends ascending and leafy. Leaves short, broad, fleshy and bluish-green in colour. Most leaves are without spots or lines but have prickly margins. Flower: Dull scarlet flowers crowd in dense heads, flowers are tubular and droop. The flowering period is January to February. 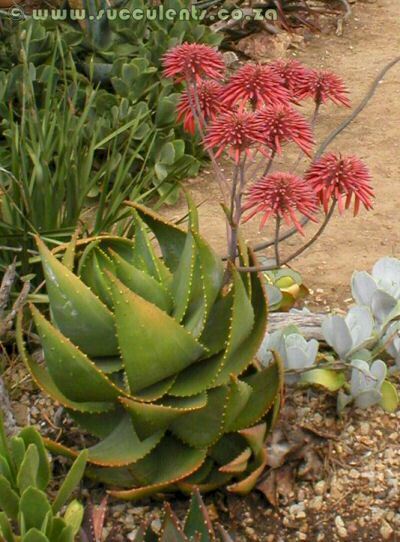 Flowering Time: Aloe mitriformis flowers in the summer months from December to February. Light: Full sun, light shade tolerated. Watering: Careful watering, drought resistent. Frost Protection: Frost protection against severe frost required.